The Salvation Army is still the place to be at the moment when it comes to pretty bargain buys - I haven't come away empty handed in weeks and the prices seem lower than the British Heart Foundation and Cancer Research, though admittedly I tend to put my change straight into the collection tub on the counter anyway. 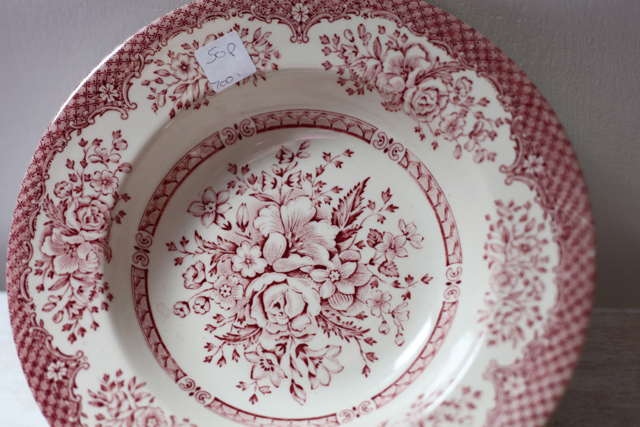 I'm not sure if there is a specific name for this type of pattern - I've always known it as transfer ware, but I love the white and red colour scheme so was quick to pop this into my basket at 50p. The candlesticks I picked up last week are the beginning of a stash of pieces I'm collecting for the bedroom where I plan to give the walls a fresh coat of soft white and pick out hues of white and blue in accessories, this little trinket pot was another blue and white gem for £1. 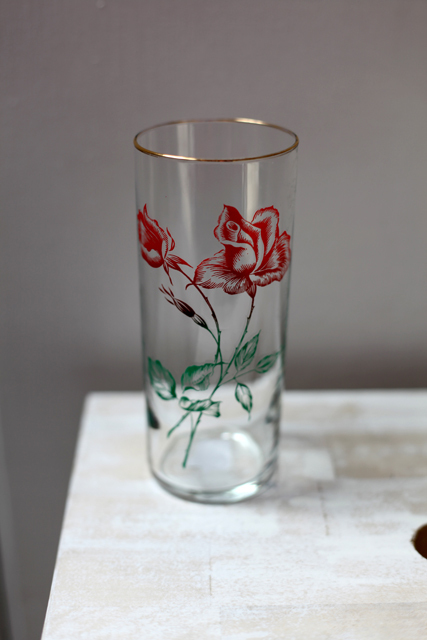 I've somehow picked up a fancy for retro glasses and couldn't walk away from this one for 10p, one of the leaves reads 'France' so I can't decide whether it was made there or is just really subtle souvenir! Tins, glorious tins! 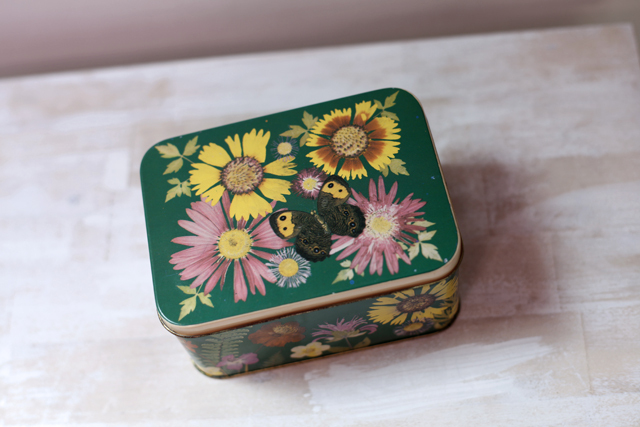 You can never have too many pretty ones to store your bits and bobs in, I was wooed by the cute florals and butterflies on this one for 30p, it reminds me of traditional Gypsy caravans - the colours and the way the flowers are painted. 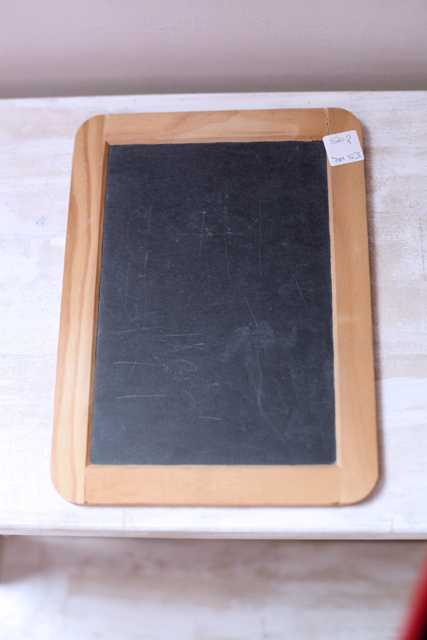 I've been stockpiling things to make over for a few weeks - last week the £5 chair, this week a couple of larger bits and this little child's blackboard for 50p. Great finds! And great prices! Thanks for sharing. I love your latest bargains Jem, especially that gorgeous glass, it reminds me of an old fashioned tattoo. The little tin is lovely too and you're right it does look like a gypsy caravan...very folksy. p.s. posting hair brush today. Yours has a few bristles missing - hope you don't mind. The front is lovely though. Wish I could send matching mirror but I didn't like its chances of surviving trip over. Hi I'm popping over from DebbieDoos and I love your prety transferware dishes. You found lots of nice things. Stopped by from Debbie's newbie party! I love visiting and seeing your Brilliant finds!! Deligtful haul! Good for you! What a lot of beautiful finds you have there. I just love that drinking glass...they are such useful items to buy as I find you can never have too many. 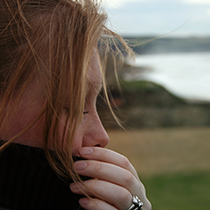 (I myself lose several a month to clumsy little fingers). I too love to go to the Goodwill or Salvation Army and find treasure! You found some fab items this week. I love transferware. I don't know if there is another word for it. 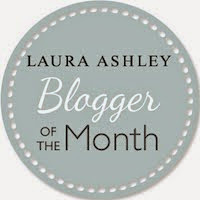 I have had a good catch up on your blog! You have so many great projects and china to share! Love that plate! I am on the hunt for some nice white ones. I wish we had a salvation army close by. Thanks for joining my newbie party. Have fun! You have got yourself some great finds there. I love the plate and little trinket pot especially. I have to agree the prices you paid are really good. Plates over here are $4 Canadian in thrift stores which is certainly more than 50p. Hi I'm visiting from the Newbie Party. You found some really pretty things. I love the dishes and that glass with the rose is so pretty. the roses on that fragile looking glass! oh wow! I totally agree about Salvation Army...in fact, it's chic these days to shop there! Our SA store is phenomenal. You've found some lovely things! All wonderful finds - so pretty. Can't pick a fave although I do like the glass and its price! That little tin was a real bargain, I saw a new tray hand painted in a Romany style the other day and they wanted over £100 for it!!! These are some great finds ~ I love tins as well. 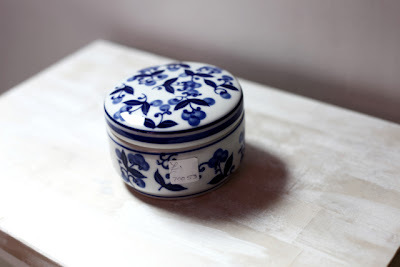 They make the prettiest storage containers. Luvvvvvvv the gorgeous plate at 50p! why i never found any plate for that matter for 50p?? sigh, are the desing on the trinket pot cherries or grapes? so cuteee! love the vintage retro glass, now i regretted not snatching those in my charity shop! the tin is soo adorable, i feel like wanting to collect those but so far havent any luck finding it, last but not least, that board (i assume chalkboard) has a great potential for craft project!! and I finally found a chair to do my next decoupage project! woohoo!! love your treasures, jem! Wonderful selection again this week. I love the red and white plates, I would have snapped them up too. Love your finds....Found you at Thrift Share Monday...Following now!!! The tin is my favourite, I love it. We have a Salvation Army store opened up this year and it certainly has good prices. 50p most paperbacks whereas British Heart Foundation are £2.95 (which seems a little steep for a charity shop). You found some nice bits and bobs - I collect up orphan glasses too, much nicer for the children to use instead of plastic. Hello! I'm visiting from Debbie's Newbie Party. I really like your header for your blog. You really scored some finds. I can't wait to see what you do with some of them. I am now following you. Come visit and follow me as well. My link at the newbie party is #92. Great finds you got there! 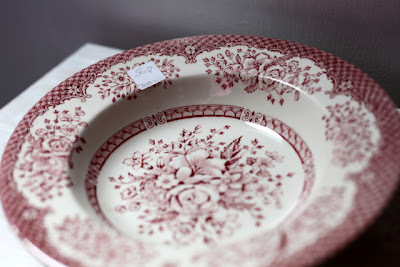 We have nothing similar here in Germany, only flea markets and second hand shops, one can find there too great things! I love them colored plates like the first one of your pictures. Visiting from Debbiedoo's. I have been thrifting and stocking up as well. Great finds! Following you! Love the red/pink transfer. You certainly were fortunate to find these thrifting. I find the charity shops in GB have some very nice things. Thanks for sharing. Bargain! We don't have a Sally Army store near us. Just their headquarters. Maybe I should suggest they open a shop. Hm! Great finds. Love the plate.